The U.S. Capitol Christmas tree lighting will broadcast on CSPAN and Facebook this Thursday. 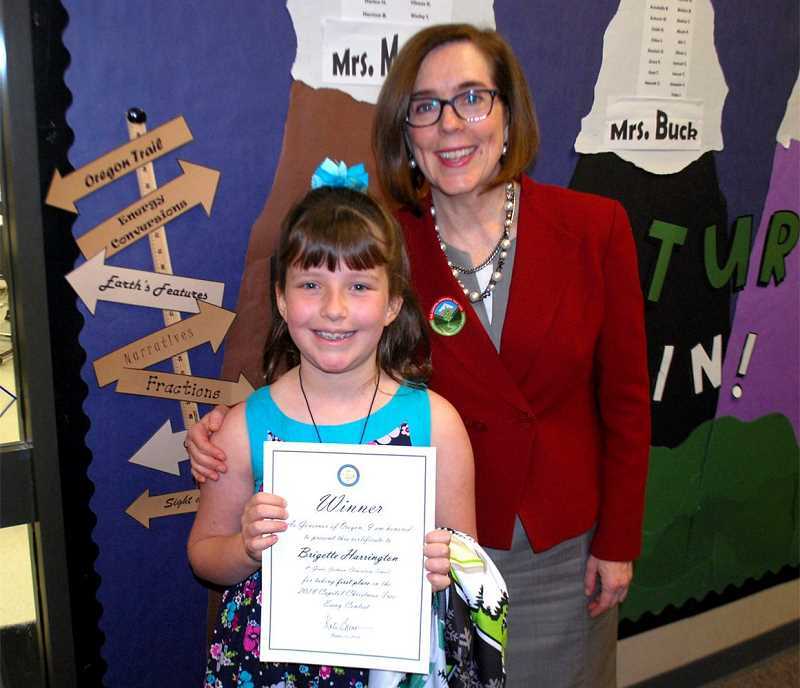 A Hillsboro fourth grader will light the U.S. Capitol's Christmas tree in Washington, D.C. on Thursday, Dec. 6. And you're all invited to watch. In October, Jackson Elementary School student Brigette Harrington was selected to light the nation's Christmas tree. Harrington won an essay contest about Oregon's outdoors sponsored by the U.S. Forest Service, and the non-profit organization Choose Outdoors. "I actually cried tears of joy (when I learned I'd won," Harrington told the Hillsboro City Council in late November. The Capitol's Christmas tree, known as "the People's Tree," will be lit by Harrington and U.S. Speaker of the House Paul Ryan during the official ceremony. Thursday, Dec. 6 at 2 p.m. — 5 p.m., Eastern time. The ceremony will be broadcast on C-SPAN and streamed on the U.S. Capitol Christmas Tree Facebook page. The ceremony will take place on the West Lawn of the U.S. Capitol. When: 2 p.m., Thursday, Nov. 6. Where to watch: CSPAN and the U.S. Capitol Christmas Tree Facebook page. Harrington and her family are in Washington, D.C. all this week to celebrate the tree lighting. Harrington spends the week participating in several receptions and events ahead of Thursday's tree lighting, including events at the National Press Club, Library of Congress and the United States Botanic Garden. She'll tour the White House and meet with Oregon Congresswoman Suzanne Bomamici before lighting the tree Thursday. The tree lighting had been planned for Wednesday, Nov. 5, but was moved after a national day of mourning was announced for Wednesday, following the death of former U.S. President George H.W. Bush. Harrington was named the winner by Oregon Gov. Kate Brown, in a surprise visit to her classroom at Jackson Elementary School on Oct. 15. Harrington's 400-word poem beat out more than 1,200 other entries from Oregon fourth graders. Harrington's poem was written in the style of "A Visit from St. Nicholas," the 1837 poem by Henry Livingston Jr., better known as "'Twas the Night Before Christmas." Each year, a different national forest is chosen to provide the Capitol's annual Christmas tree, according to the National Forest Service. This year's tree was cut down in the Willamette National Forest near Sweet Home, a small town about 40 minutes east of Corvallis. Oregon last provided the national Christmas tree in 2002. This year's 72-foot-tall evergreen is the first noble fir ever displayed on the Capitol lawn.